In the single best episode of The Simpsons, Hank Scorpio—billionaire CEO and global supervillain—brags to his new employee Homer that he was the very first rich guy in America to wear a sport coat with jeans. That joke was written in 1996, which is its own evidence for just how long this look has been a men’s style staple. 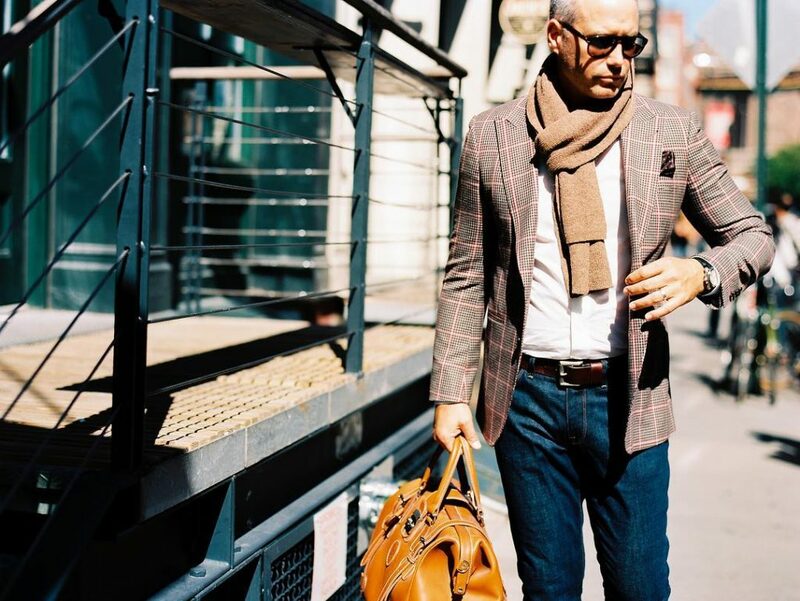 For decades, men have matched their favorite jacket with their favorite jeans to strike the perfect balance between casual and professional. On the surface, this is a simple and seemingly mistake-proof combination for anyone who struggles to coordinate their outfits; after all, matching a jacket to a pair of jeans is a more straightforward matter than, say, mixing bold suit patterns together. Once you’ve selected your pants and your jacket, the overall look is well on its way to taking shape. But the simplicity is also what makes it challenging: Each small choice is crucial to pulling together a sharp, polished outfit. A blazer paired with jeans is a relaxed, stripped-down look that can be dressed up more than you might initially think. The overall success of this outfit comes down to three simple actions: choosing a sharp blazer, picking the right jeans, and accessorizing with confidence. It should come as no surprise that the “blazer” part of the blazer-and-jeans combination is significant. Your choice of fabric and cut will make or break the look. For fabrics, relaxed weaves like linen or chambray work well in the hot months when you don’t want to sweat your way through your jacket before mid-morning. In colder months, thicker material like tweed or wool will keep you insulated. As suit jackets are specifically designed and intended to be worn with a single matching pair of trousers, pairing one with jeans is considered a fashion faux pas. Suit jackets and blazers are not interchangeable; the elements that give suit jackets their distinct level of polish—the padded shoulders and the structured lining—are also what make them look awkward with jeans. Avoid this rookie mistake and leave your suit jacket in the closet when you’re reaching for your jeans. Your jacket should be fitted in a way that feels comfortable and looks sharp. A well-cut blazer will highlight your shoulders and give you a powerful silhouette. Two-button jackets are ideal, but you can make a blazer with three buttons work with this look; just leave the very bottom button undone to maintain a relaxed elegance. Your choices in terms of color and pattern are nearly limitless. If you opt for a blue blazer, particularly one made from an unpatterned fabric, make sure the shade isn’t a close match for the color of your jeans; this might summon unwanted comparisons to the much-lampooned Canadian tuxedo, a disparaging term used to refer to the pairing of blue jeans with a blue denim jacket. 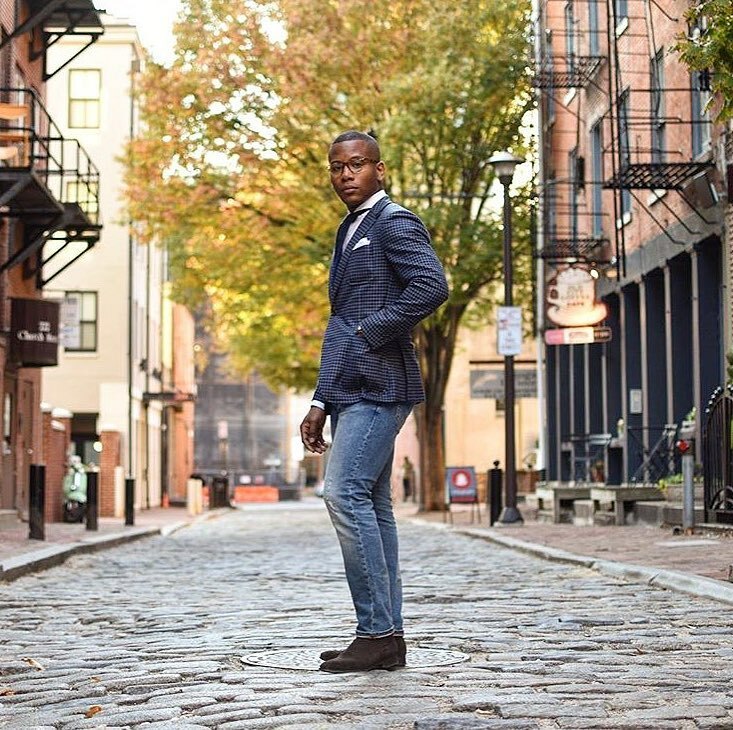 First and foremost, wear slim or skinny-fit jeans when you’re matching them with a blazer. Any kind of straight-legged jeans are fine, but avoid ones that are oversized or feature loose-hanging cuffs that bunch up around the tops of your shoes. You can’t create a clean, crisp silhouette if your pants are shapeless and baggy. When pairing jeans with a blazer, it may help to think of this outfit as a variation on a suit, in which the trousers are cut and fitted to complement the cut and fit of the matching jacket. As for the color, dark jeans will help the outfit lean toward the professional side of casual. During the summer months, pairing lighter jeans with a lightweight cream, tan, or beige blazer can look breezy and effortless, but darker shades are a safer pick once the calendar hits fall. You can dress your outfit up or down with your selection of shirt, shoes, belt, and other accessories. As a general rule, follow the same template that you would when trying to accessorize a suit. If you want your jeans and blazer to look more formal, add a dress shirt, a tie, and a pocket square. In relaxed workplaces, this combination may very well meet the definition of business casual set out for employees. If you’re wearing this outfit to work, always opt for a professional shoe. Oxfords or low boots—think chukkas, also known as desert boots—will help you dress the outfit up the scale. If you’re going out for a night on the town or to a relaxed party, your most stylish sneakers can be an eye-catching footwear alternative. Don’t wear old or beat-up shoes; they’ll make the whole outfit look sloppy. In case you were wondering, yes, you should tuck your shirt in. No, it doesn’t look better untucked. Under certain circumstances, a shirt with the front hem partially tucked into the waistband of your jeans can look unfussy yet stylish; as soon as you add a jacket, however, your shirt must be securely tucked in, front and back. However you style the look, always remember this: The fit is the most important aspect of any item of clothing. A well-made and well-fitting blazer should be looser than a suit jacket while still retaining a clean, flattering shape; a blazer that hangs on your frame like a potato sack isn’t going to pair well with jeans, or with anything else in your closet. While you may be able to find what you need on a department store rack, the surest way to end up with a blazer that fits and flatters is by entering the world of custom-made clothing. Apart from ensuring a precise fit, a high-quality custom clothier will also provide you with near-endless options in terms of fabric, pattern, style, and customization. To experience the advantages of custom clothing for yourself, visit a Knot Standard showroom or connect with a personal stylist online. We’ll work with you to create a blazer that pairs with your favorite jeans—or we’ll help you create any other garment you want to have in your wardrobe. Once you’ve experienced the difference, you’ll be reluctant to return to the ordinary realm of ready-to-wear clothing.